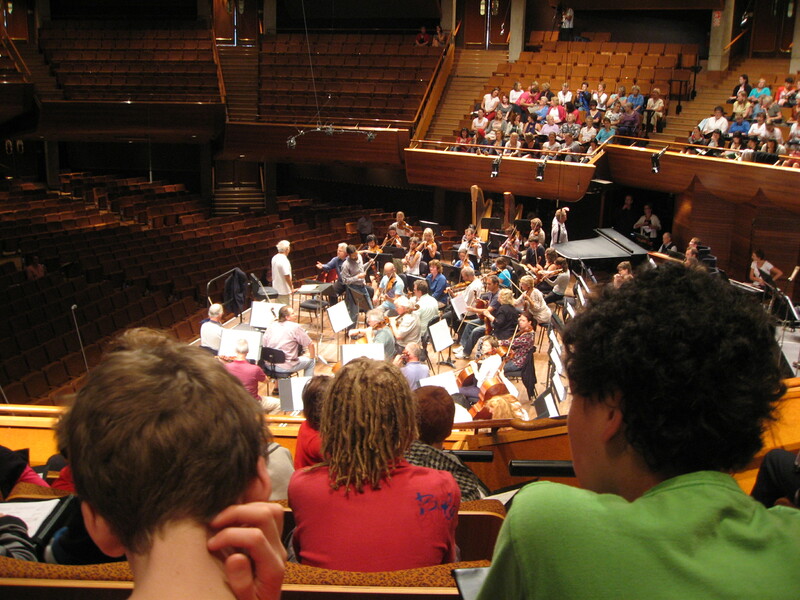 If you’re thinking of taking your kids to listen to the orchestra, and you’re not sure where the best seats are, read on. An orchestra is like a well-oiled machine … timing, rhythm and accuracy are almost everything. Heart is the one thing a machine doesn’t have … an orchestra does, every single part of it. Although I’m quite happy to sit in any place of the auditorium, my favourite spot is the one that has an overview of the orchestra. Just as in this photo – although I do like to be further forward. I grew to favour this spot when my children were young I was trying to interest them in orchestral music. You can see everything from this perspective. You can watch every instrument, see how it’s played, observe when the the musician prepares for his or her entry, and watch them as they follow the lead of the conductor. You can hear the sound each of the instruments makes, whether playing solo or in partnership with others. Of course, for boys, the real excitement comes when the drums roll, the cymbals clash and thunder breaks out in the percussion section. Personally, I just love watching the conductor – some of them literally dance on their podium. Years ago, I was privileged to sing in a choir under the directorship of german-born Rita Paczian. In concert she always wore a very unstructured jacket for ease of movement. Friends always commented after he concert how graceful and beautiful her movements were and how mesmerising. During the Mahler, when I wasn’t busy counting bars for our next entry, I was fascinated by Maestro Ashkenazy’s style. He was incredibly expressive – the music flowing through his whole body. Seats above the orchestra, as close to the front as possible, are the absolute best for kids. They need to see as well as hear and they need to connect what they’re seeing with what they’re hearing. 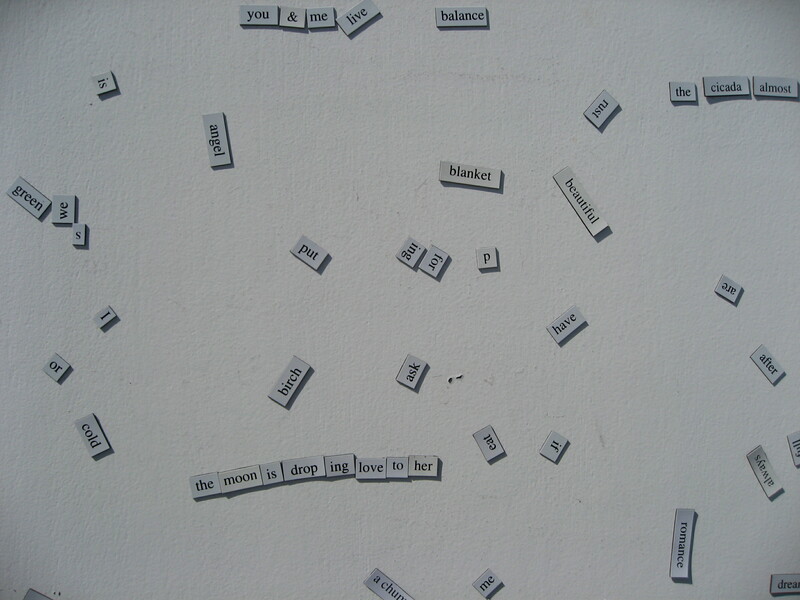 This entry was posted in Music, Uncategorized on February 28, 2010 by Rossi. Organising a cast of thousands (well 300 really) who come from all parts of the country requires a high level of preparation, time, patience and a dose of humour! 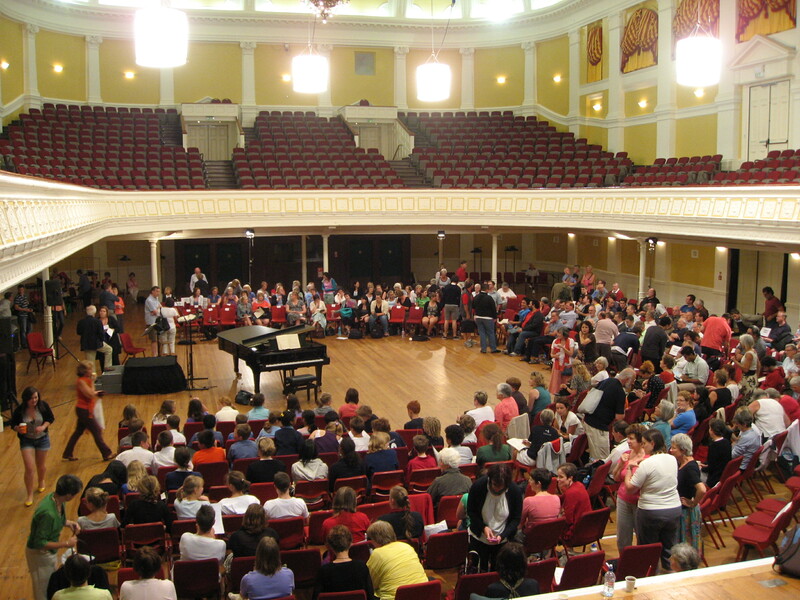 The Wellington cast – comprising children from Cathedral choir and St Marks School, and an augmented Orpheus Choir – have been in rehearsal since last September. It has been quite a build up. We had Christmas in between; it hasn’t been a continuous rehearsal period but as always, it gets busier as the performance date closes in. 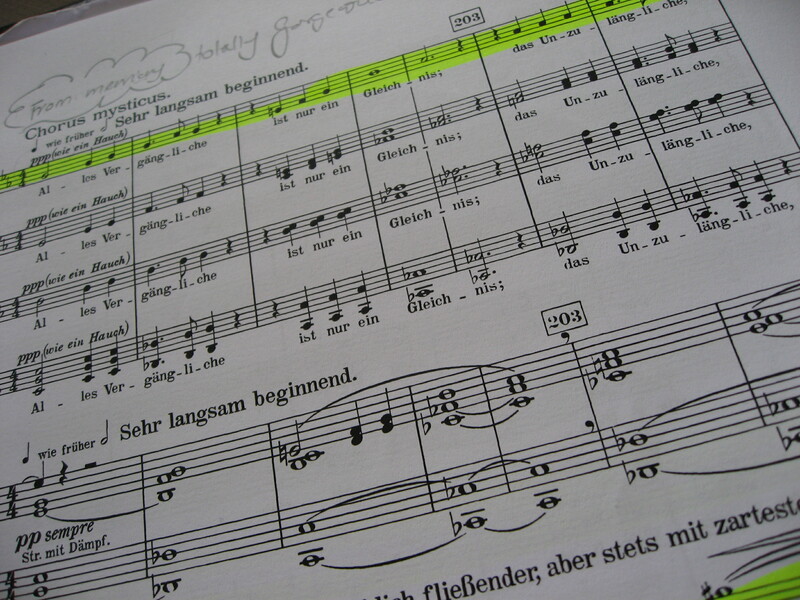 It is all so worth it though, especially in the opening bars of the Chorus Mysticus which concludes the piece. The sounds now appears to come from nowhere … The soloists are thrilling, particularly New Zealanders Martin Snell and Simon O’Neill. What a huge wealth of talent there is on show! Singing under the baton of Maestro Vladimir Ashkenazy is an incredible experience. His stature is huge in the world of music – not physically though! Ashkenazy is a man in his seventies, with a shock of white hair and an olive complexion. He speaks softly with a thick Russian accent and when giving direction that he doesn’t have words for, he communicates with every part of his face and his body – we understand. I love being part of this event – passionately so and wouldn’t have it any other way – but one part of me would so like to sit in the audience to experience the glorious sound. This entry was posted in Uncategorized on February 25, 2010 by Rossi. As I look at this photograph I have Mahler’s 8th Symphony playing in the background and the world feels full of promise. I’m in the beautifully angelic section in the symphony where the Knabenchor (children’s chorus) are singing … and I’m thinking just how well the children from the Wellington Cathedral choir performed it last night in rehearsal. The sound they made was amazing … spine chillingly glorious. Our performance (note the possessive tense) of Mahler’s 8th is being broadcast in the square. There was such huge interest in the performance and so few seats available, that the Festival committee (in their wisdom) have organised for broadcast in the square, on radio and also on the internet! Don’t miss it – opportunities like this are rare! This entry was posted in Uncategorized on February 23, 2010 by Rossi. The International Festival of the Arts brings more variety to our already vibrant city life. There are only a few thoughts strung together at the moment – I have no doubt there’ll be a huge surge in activity once people realise the opportunity’s there. The sad thing about this great installation is that it needs a minder – I presume for 24 hours a day. A security guard looking pretty bored really. I think I can understand that…I mean standing there for hours on end, unless you’re the sort that loves the passing parade, could get tiresome. Especially if the weather turns for the worse. 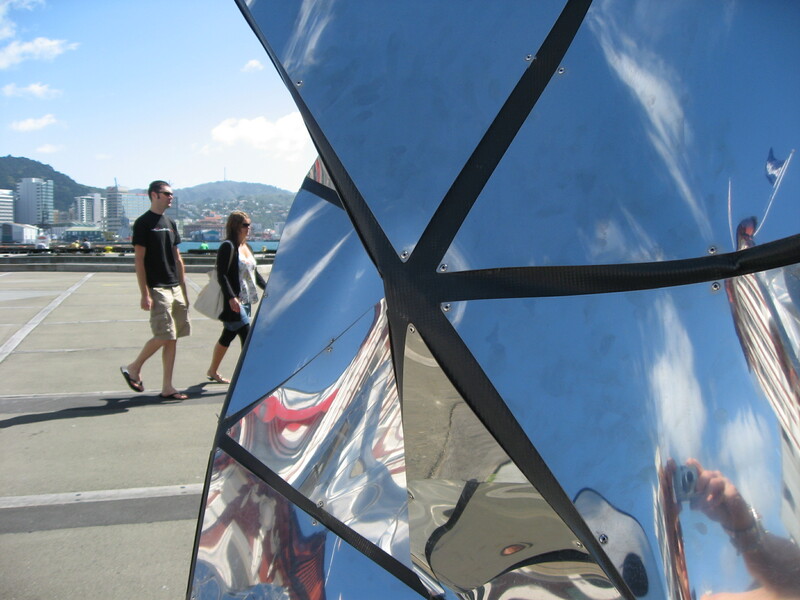 But good on you Wellington – I love it. I wish I’d thought of it! This entry was posted in Uncategorized on February 20, 2010 by Rossi. Some things are really worth getting out of bed for. 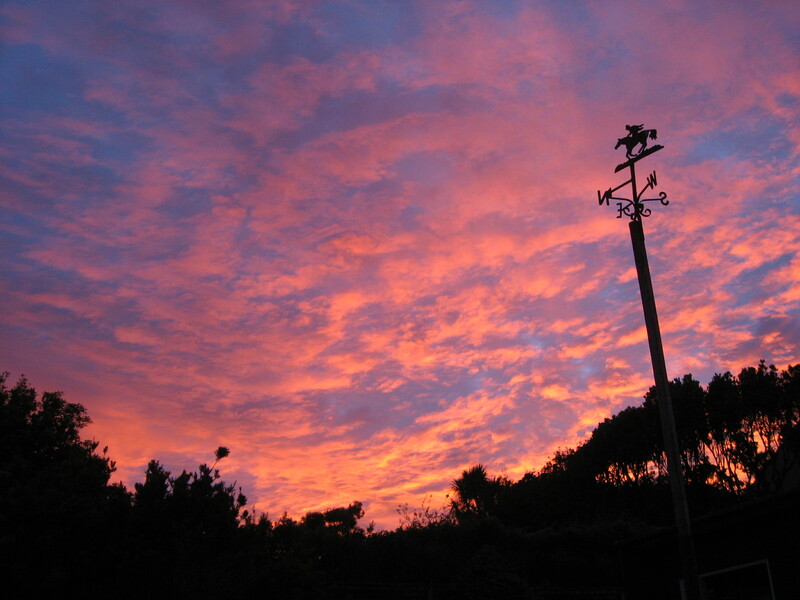 When I arose in the semi-dark for a walk this morning, I was rewarded with a spectacular sky. What a breath-taking way to start the day. It has a way of making you feel really good about being alive especially in the light of so many recent tragedies. This entry was posted in Uncategorized on February 17, 2010 by Rossi. From my perspective, music breaks through all barriers. I must admit to harbouring still one or two reservations about the German race (in general) because of my family’s experience during WWII. I know that that thinking negatively is quite irrational and that children are in no way responsible for the sins of their fathers. However, there it is and I can’t help it. I must point out that my feelings have never stopped me from developing friendships with people from Germany. I’m not that blinkered! But with music, its origin never concerns me (except perhaps for the works of Wagner). Although I was not brought up in a church-based religion, I have always absolutely adored church music. I have always sung in choirs and some years ago was director of a catholic church choir. Currently I’m rehearsing with the Orpheus Choir for a performance of Mahler’s 8th Symphony in the Michael Fowler Centre, Wellington on February 26th. The performance is the opening event for the New Zealand International Festival of the Arts. The work is sublime – there’s no other way to describe it. Mahler’s Symphony No.8 is a work of great tragedy and great triumph. Our choir is joining three other choirs, internationally acclaimed soloists and the New Zealand Symphony Orchestra with Maestro Vladimir Ashkenazy conducting. Although we won’t number a thousand, there will be over 300 singers in full voice. It is so exciting and promises to be one of the highlight’s of my musical life. I love singing in German; I love the sounds of the language and am proud of my ability with pronunciation. The Chorus Mysticus (above) is my favourite section. It is so beautiful and soulful, full of emotion and tension. I find it hard retaining my composure when singing it – I find my eyes tearing up and have to work hard to stop the lump rising from my chest. This entry was posted in Uncategorized on February 15, 2010 by Rossi. Food – yet again. I can’t seem to get away from it. I’d made a cheese cake earlier in the week for a shout at work and had bought far too much of the essential ingredient. I promised the family that I’d use it for their benefit over the weekend, so got to work this morning wanting to make the most of everyone being around for two eating opportunity days. As I was making good on the promise, I got to thinking about yet another family tradition – the cheese cake. As with most of the other food we ate growing up, our love of cheese cake was well ahead of New Zealand time! Of course it was always devoured with great relish…we weren’t stupid! She went on to say that she was hosting a dinner party in a few weeks time for the ‘Prostitutes Collective’ and could she possibly have my mother’s recipe for the cheese cake. I must admit to feeling quite taken aback – and affronted! On the one hand, I felt incredibly flattered (on behalf of my Mum) that her cake had made such an impression upon a young teenager so many years ago. And on the other, I wondered what she would think about the dinner guests. Now don’t get me wrong. I know that my Mum thought very highly of our babysitters and their family, and I remember raised eyebrows during discussions about their different (but interesting) paths in life – very very unconventional. Without doubt, they were a very talented family. So, I thought she wouldn’t mind me passing on the recipe. However, as with most of her handwritten lists of ingredients and methods – nothing was exact. No quantities given…she went on texture, consistency and memory. I did as best as I could – given that I’ve never been able to replicate the cakes she made. I made approximations on her behalf, explained that the results would not live up to the memory – and sent them off. 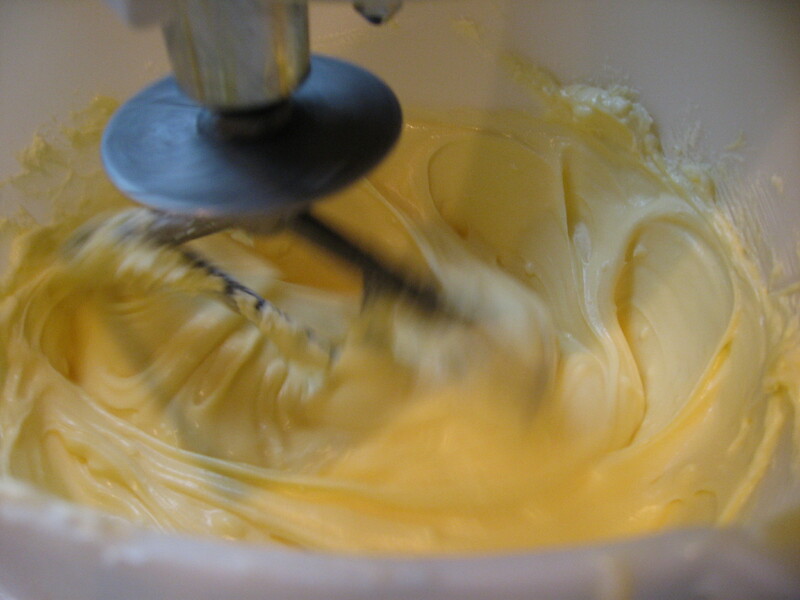 I’ve used many different recipes for cheese cake over the years and always enjoy them. However, I’ve never enjoyed them as much as the ones my Mum used to make. This entry was posted in Uncategorized on February 13, 2010 by Rossi.